"Well-rounded seafood and pasta dish. Good with any pasta; angel hair is less filling." Bring a large pot of salted water to a boil; cook linguine in boiling water until nearly tender, 6 to 8 minutes. Drain. Melt 2 tablespoons butter with 2 tablespoons olive oil in a large skillet over medium heat. Cook and stir shallots, garlic, and red pepper flakes in the hot butter and oil until shallots are translucent, 3 to 4 minutes. Season shrimp with kosher salt and black pepper; add to the skillet and cook until pink, stirring occasionally, 2 to 3 minutes. Remove shrimp from skillet and keep warm. Pour white wine and lemon juice into skillet and bring to a boil while scraping the browned bits of food off of the bottom of the skillet with a wooden spoon. Melt 2 tablespoons butter in skillet, stir 2 tablespoons olive oil into butter mixture, and bring to a simmer. 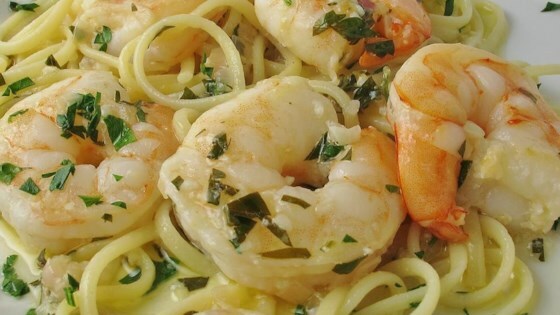 Toss linguine, shrimp, and parsley in the butter mixture until coated; season with salt and black pepper. Drizzle with 1 teaspoon olive oil to serve. Very tasty, was a tad dry. I'd recommend adding 1/2 - 1 cup of the pasta water to keep it moist. loved it! Unfortunately, we ate it before I remembered to add a photo. I like my food a little spicy, so I added more red pepper and salt. Easy and delicious. Try it, you won't regret it!